Hello hello! We're back in Melbourne now, pretty much all settled in - unpacked and back at work. I'm feeling pretty decent, apart from some minor jet lag - I'm up bright and early at six every morning, and ready to collapse by eight at night! Eep! The holiday in Germany was soooo great, but after one glorious month of eating lovely homecooked German meals, coupled with gigantic ice-creams every other day, I'm really hoping I can stay on track with healthy eating and exercising regularly! 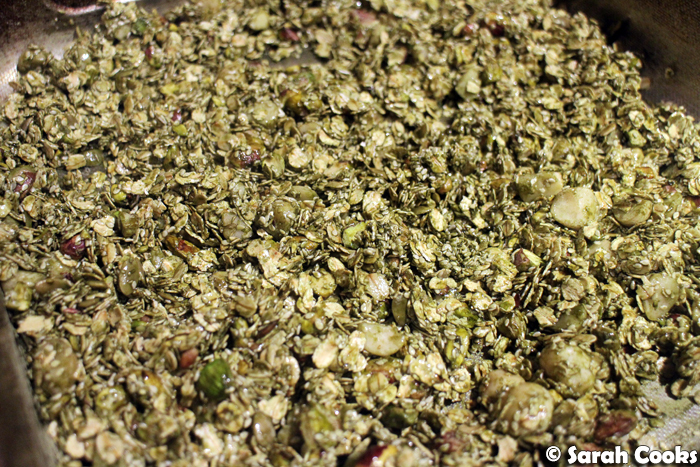 And speaking of which... the very first thing I made after we got back was this batch of matcha granola. While I was in Paris (just two weeks ago!) 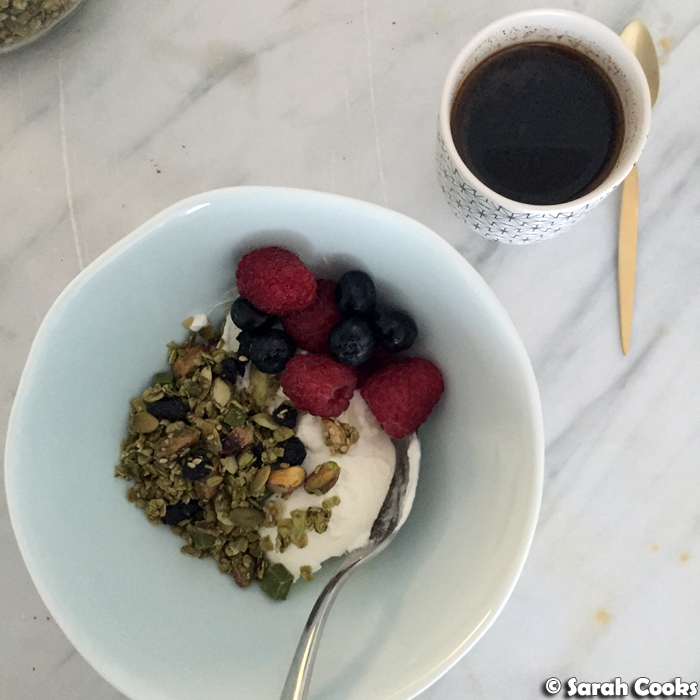 with my friend Clarice, we ate her homemade matcha granola for breakfast and it was so wonderful. 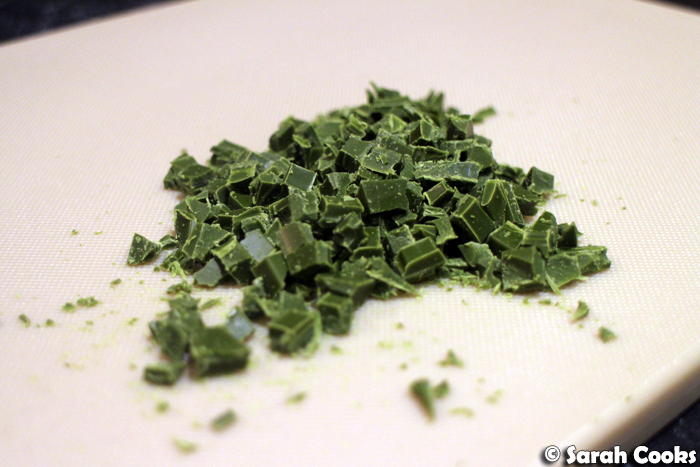 It was crunchy and lightly sweet, with a prominent matcha flavour. 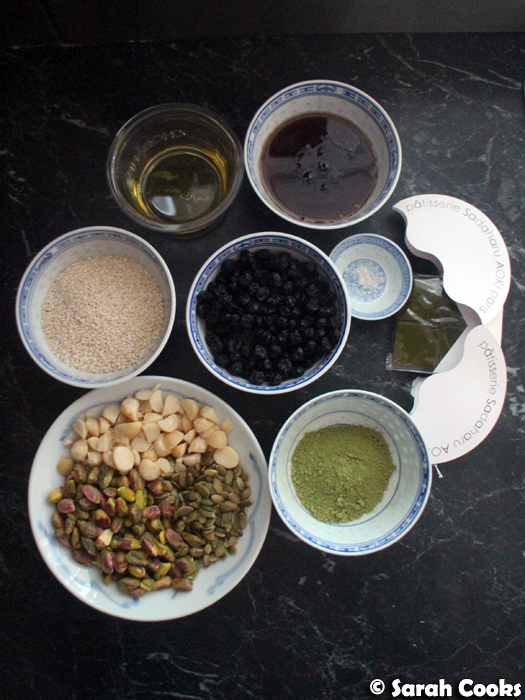 She adapted her recipe from one on She Who Eats - oats, dried blueberries, sesame seeds, nuts, maple syrup, oil, a pinch of salt, some matcha powder and some matcha chocolate. Funnily enough, while we were away, I got a couple of emails offering me free matcha samples to try for my blog. Perfect timing! 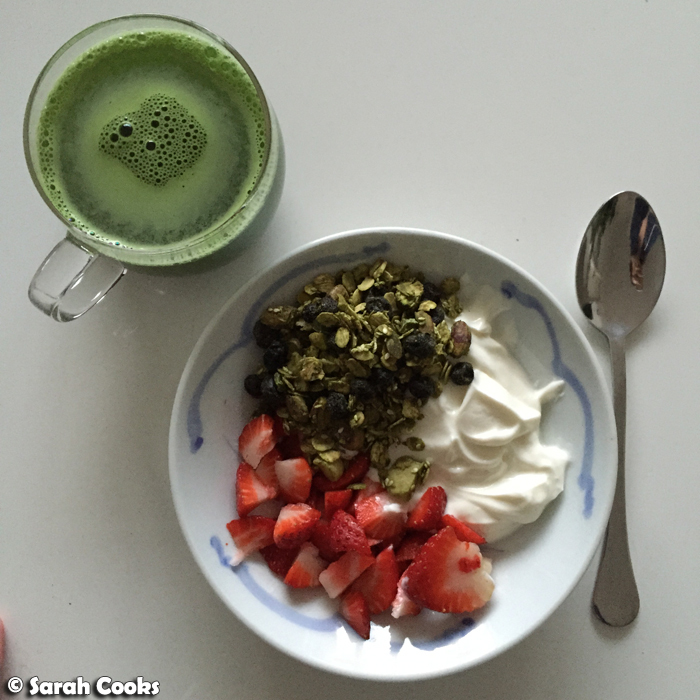 So when I made the granola myself, I used Kenko Tea's cooking grade matcha. For the nuts (heh) I chose a mix of pepitas and pistachios, to echo the green vibe, and macadamias because they're awesome and because I had them in the pantry. Making the granola is a simple matter - it's just a matter of chopping and stirring and baking. Boom! The only unusual step was that the oats are baked first, before the other ingredients are added, so that the oats can get nice and toasty without the matcha powder overcooking and losing its colour or flavour. 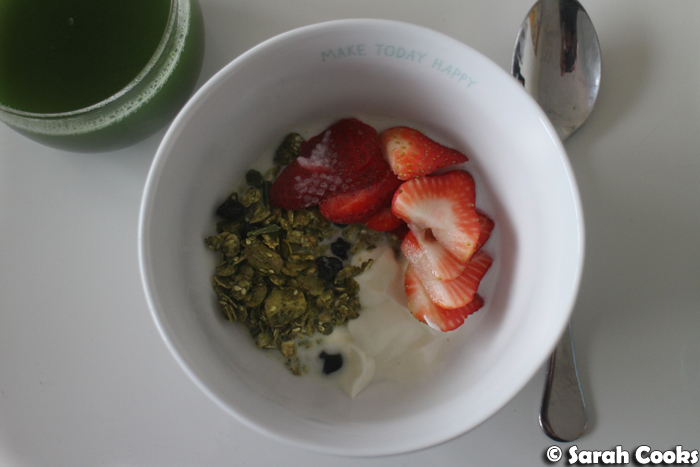 I've got a big jar of matcha granola in my kitchen now, and it makes an excellent breakfast with some yogurt and fruit, or a fantastic snack by itself, grabbed in spoonfuls from the jar. Woohoo! Preheat oven to 120˚C. Line a large baking tray with baking paper. Place the oats in the tray and bake for 20 minutes, stirring once or twice during the baking time. Remove the tray from the oven and allow to cool. (Leave the oven on). Either way, add the mixed nuts and seeds, sesame seeds and matcha powder to the oats, and stir together to combine evenly. 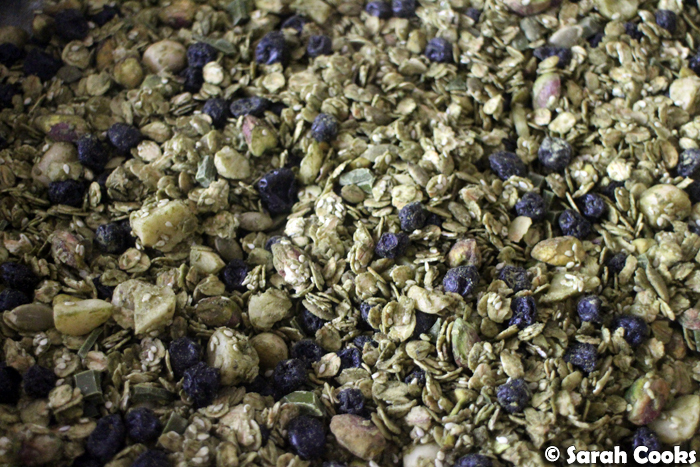 Allow the mixture to cool completely, then stir in the matcha chocolate and dried blueberries. Store in an airtight container. I love this idea - I've been curious to experiment with matcha for a while now, I think this is going to be a good recipe to start with! What a gorgeous idea for matcha! I'm a bit obsessed with the stuff so this is going on the list. And welcome back too! Wait. What? This is damn near genius stuff!